M10J What I Learned From Two Military Weddings One Year | GOD Who Are You? AND Who Am I? The year 1997 was a special year. Our two oldest children married. Both marriages were military weddings. Kurt graduated from the United States Military Academy and Francy’s fiancé Scott was in the same graduating class, although they did not know each other at the time. Francy was a student at Kansas State University in Manhattan, Kansas, not far from Fort Riley where Scott was stationed after graduation. Kurt told his friend Mark at Fort Riley about his sister, but Mark’s roommate and friend, Scott, pursued her— and won. February, 1997, Kurt married his high school sweetheart, Davi, after she graduated from college in Iowa. Their church’s tall front steps provided a beautiful setting for the two rows of officers, dressed in their military blues, to form on each side of the bride and groom as they descended. No one was prepared to see the last soldier slap the bride on her backside with his saber as she passed by—officially welcoming her into the Army. 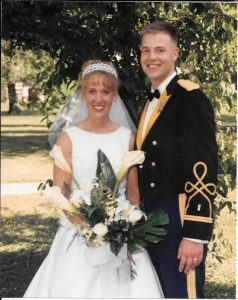 June, 1997, Scott and Francy decided they wanted a large wedding with a banquet afterwards. They put in all the work and most of the expense. It was quite a formal military affair with exquisite decorations. Invitations were sent out with an RSVP for the banquet. 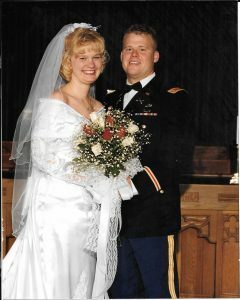 I tried to keep my list mostly to family because of the expense involved for the couple, and they had numerous military friend graduates coming just as Kurt had done. “Many will say to me on that day, ‘Lord, Lord . . . I will tell them plainly, ‘I never knew you’” (Matt. 7:22-23). Others responded affirmative, but they did not show up. Francy gave away food she and Scott had paid for, and if I’d known that would happen, I would have invited more of my friends. I did not invite some people who meant a great deal to me, and I still regret it, because there was plenty of room and food for all. The banquet came AFTER the wedding. The bride knew who she was. She knew her bridegroom; she was prepared for the wedding. She was married before that banquet celebration ever commenced. Is it any wonder that Jesus’ first miracle was at a wedding? Maybe He was trying to show us who we are–His bride– rather than tell. These lessons were marvelous for me as I related them to the parable of the ten virgins who waited on the Lord to open the banquet door to the wedding feast. Only half were ready; the other half did not show up. The following download is a bible exercise of 12 characteristics of a mature relationship: in the natural, and in comparison to our relationship with Jesus Christ. This whole Bible study eCourse on this Web site takes an in-depth look at each of these attributes. I invite you to sign up for this free eCourse now, if you already have not done so. God bless you.